Start the tool from the command line with mlnlearn. The MLN learning tool learns the weights of a MLN file given a training database and a template MLN. The tool allows you to invoke the actual MLN learning algorithms of the Python-based MLN engine. Once you start the actual algorithm, the tool window itself will be hidden as long as the job is running, while the output of the algorithm is written to the console for you to follow. At the beginning, the tools list the main input parameters for your convenience, and, at the end, the query tool additionally outputs the inference results to the console. The tool features an integrated editor for *.db and *.mln files. If you modify a file in the internal editor, it will automatically be saved as soon as you invoke the learning method. The new content can either be saved to the same file (overwriting the old content) or a new file, which you can choose to name as desired. Furthermore, the tool will save all the settings you made whenever the learning method is invoked, so that you can easily resume a session. Parameters in the GUI Tool. In the text field ‘Add. Params’, you have the opportunity to pass additional parameters to the tool and the learning algorithms, respectively. The parameters need to be specified in the Python dictionary syntax as they will be transformed into and passed to the algorithms as python dictionaries. debug='<level>' This will temporarily set the debug level to the one specified. Admissible values are (with decreasing level of verbosity): DEBUG, INFO, WARNING, ERROR, CRITICAL. optimizer='<name>' Specifies which optimization routine to be used. See also Learning Methods for more information. 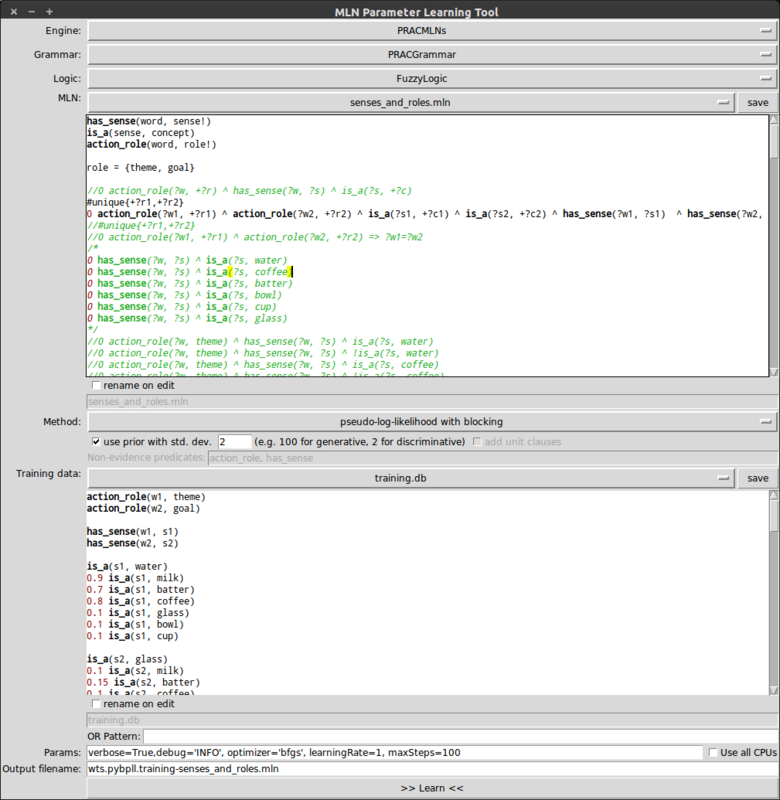 profile=True/False Launches the learner via the python profiler.